Mary Ann & Jay got married at Catholic Newman Center at University District in Seattle. After the ceremony, we stayed around the church to take some bridal party pictures along with some couple portraits. 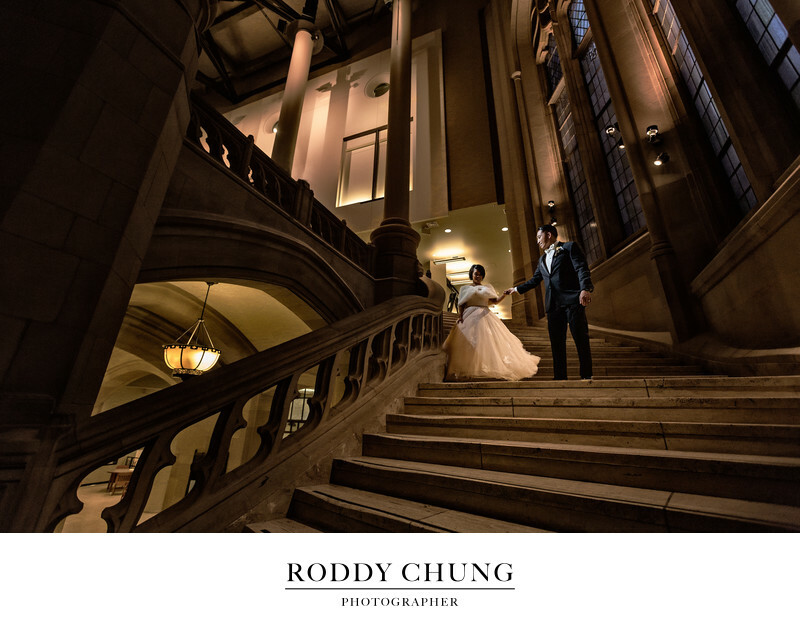 Just as we sent the wedding party off to the reception venue and were thinking about where to go for more couple portraits, we realized, "why don't we go to Suzzallo Library? Suzzallo library on the UW Seattle campus is famous for its Gothic style architecture. And a lot of people in the younger generation actually call it the Harry Potter room as it draws a lot of visual similarities with the Hogwarts School. As a result, it has become one of the most sought after spots for engagement and wedding photos. Inside the building, the spiral staircase is a go-to scene for photographers aside from the study room itself. The view here is just absolutely stunning. I would take my couple here every chance I get for a photo shoot. For photographers: I used a 16-35 wide angle lens to magnifies the interior architecture. With the stretching effect from the lens, it creates a dramatic scene. Then I used an off camera flash to light on the couple so the subject does not lose the focus from the magnificent view. Photo captured from a 2nd shoot with Ben Nguyen. Location: 4000 15th Ave NE, Seattle, WA 98195.